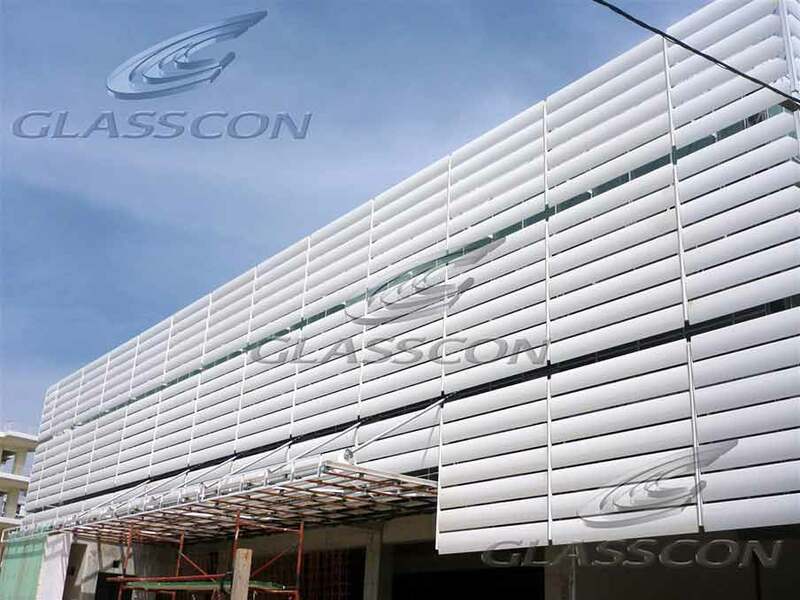 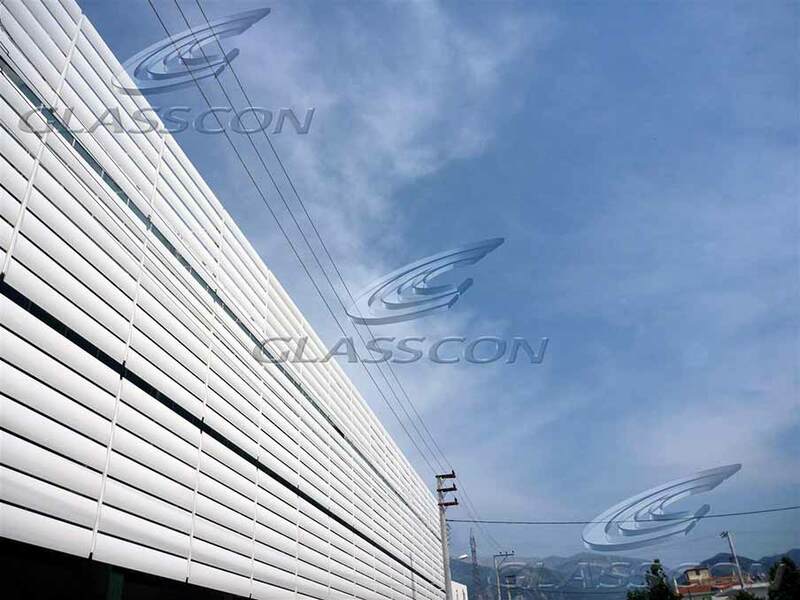 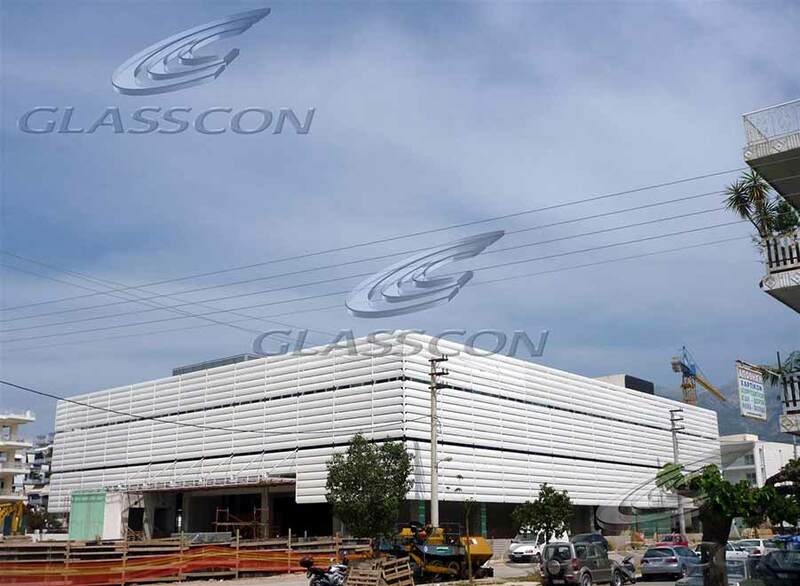 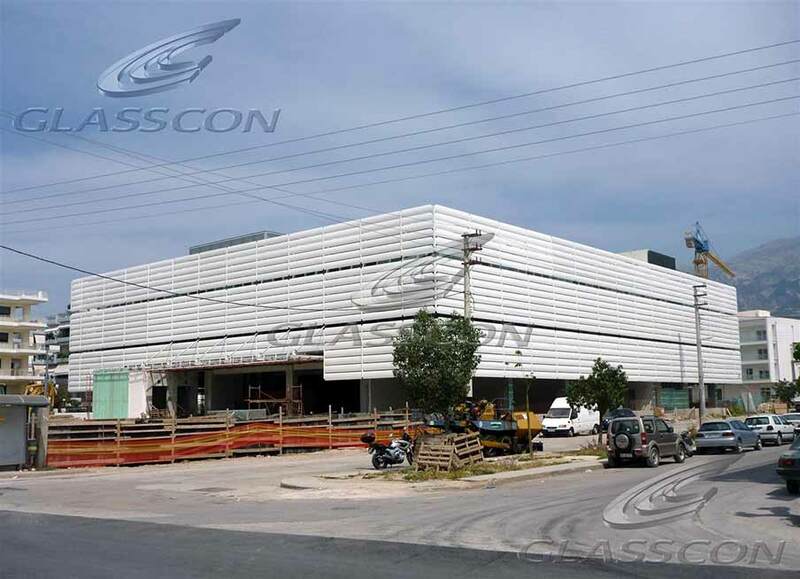 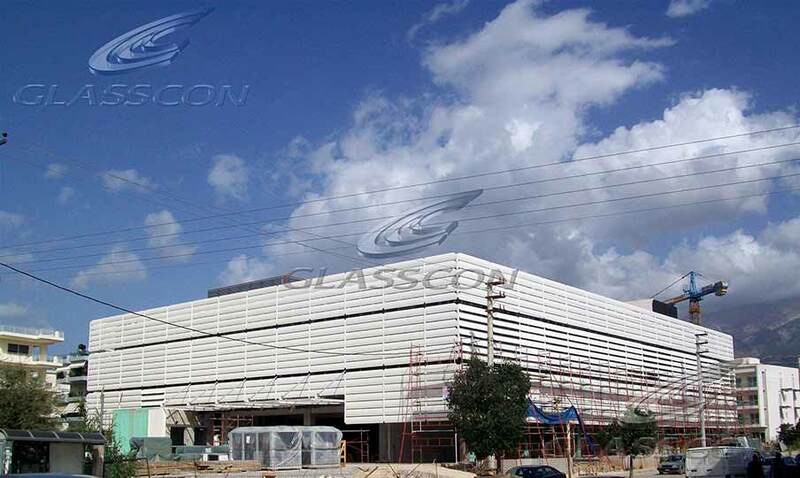 GLASSCON designed and constructed a system of automatic movable aluminum louvers for the facades of a Telecom office building. 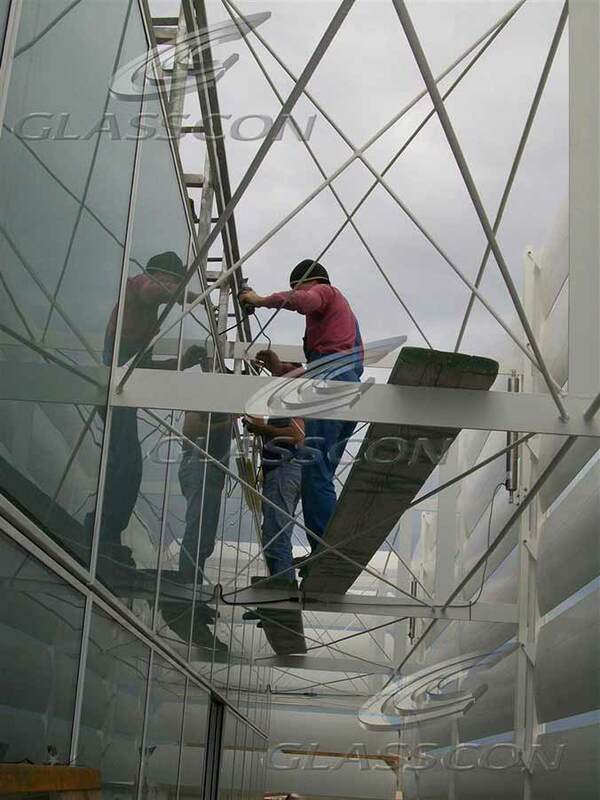 The motion/rotation is achieved by stainless steel IP 65 motors from ELERO Germany and automatisation control system from WAREMA Germany. 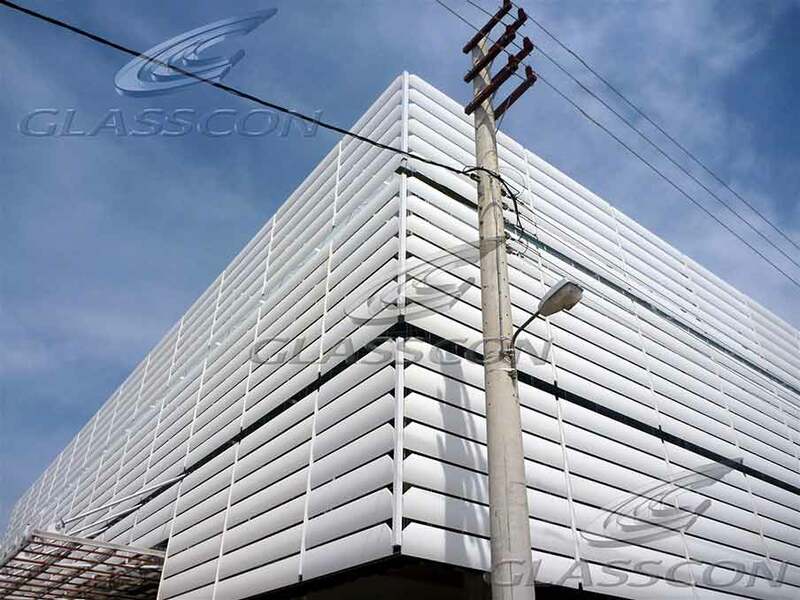 The total surface covered by the louvers is 3500sqm.GLASSCON metal louver shading systems and airfoil solar blinds is a fixed or controllable external aluminum solar shading system that may be installed either vertically or horizontally in front of the façade. 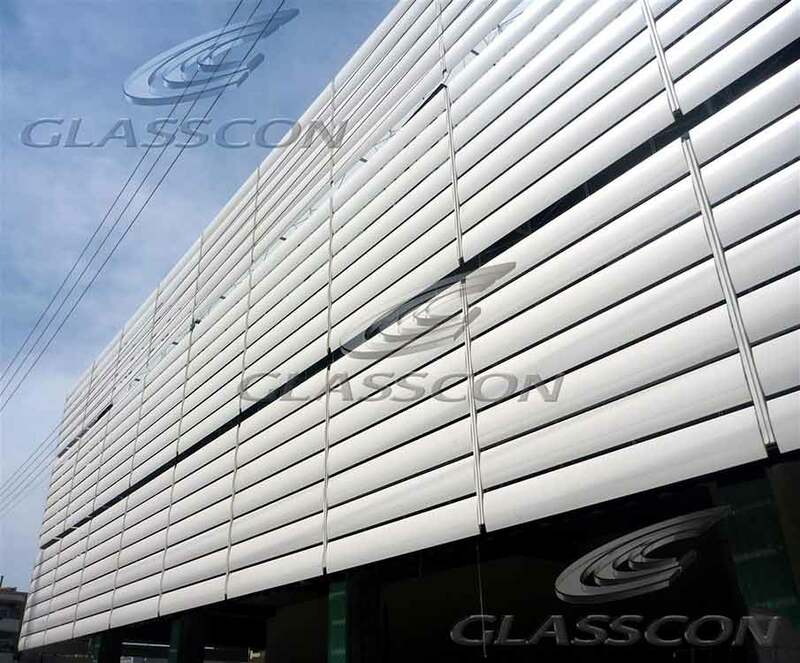 It may also be combined with other GLASSCON products such as roof lights and glazed facades. 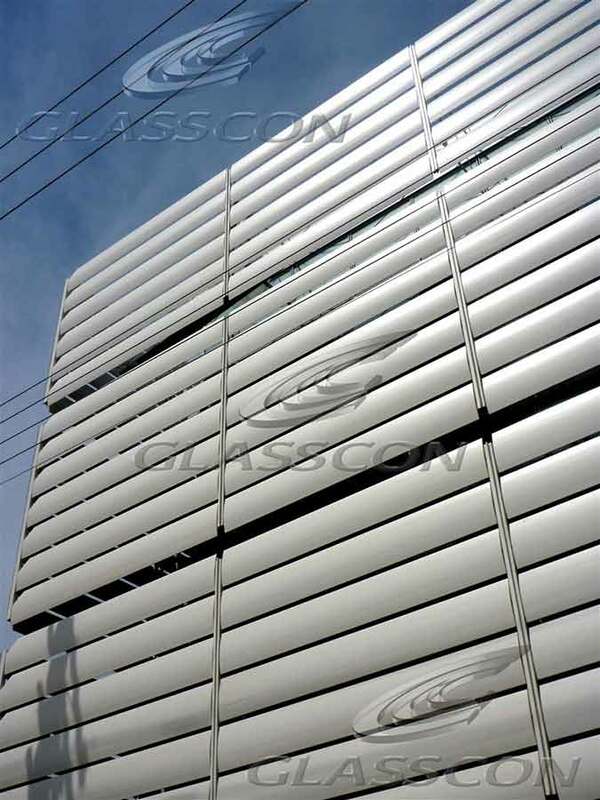 GLASSCON metal blinds/louvers and airfoil louvers are available in a variety of colours. The frame and blades are made of powder-coated or anodized aluminum. 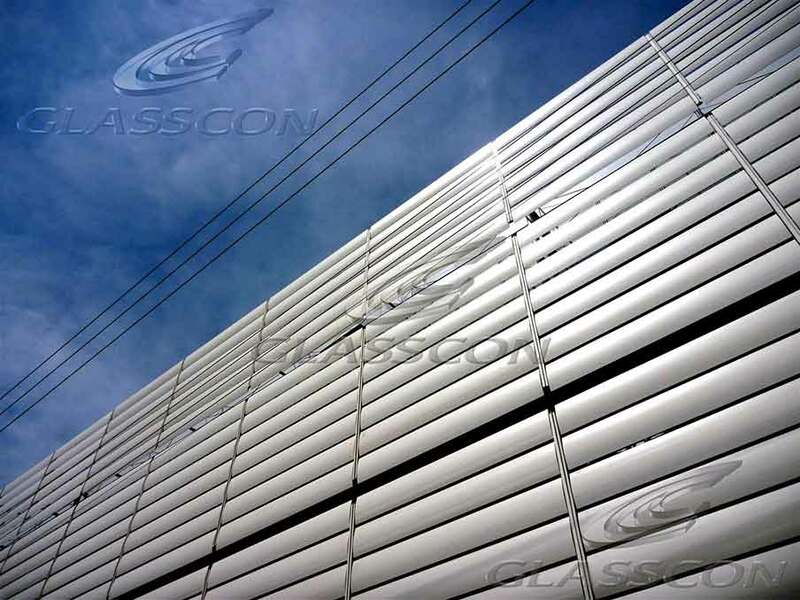 Properly engineered, these structures can resist wind loads of up to 150 km/h. 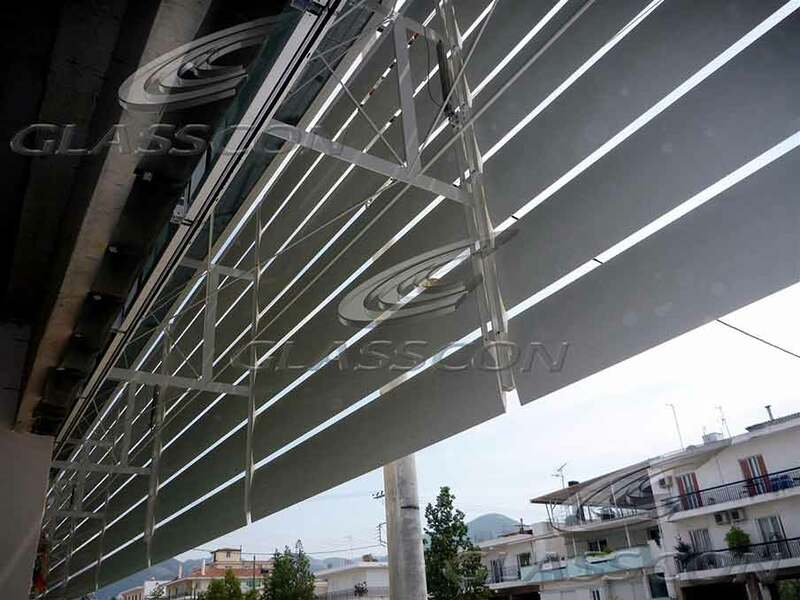 A variety of blade control options include: manual by friction, mechanical or electrical remote control.The GLASSCON solar shading system comprises a series of extruded aluminium fins mounted into a support frame. 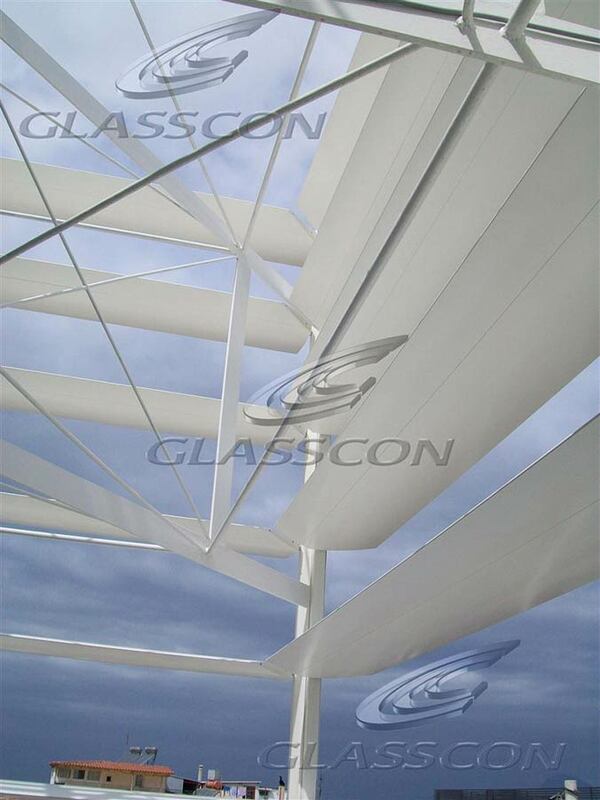 The fins may be fixed at any angle and can rotate under motorised control. 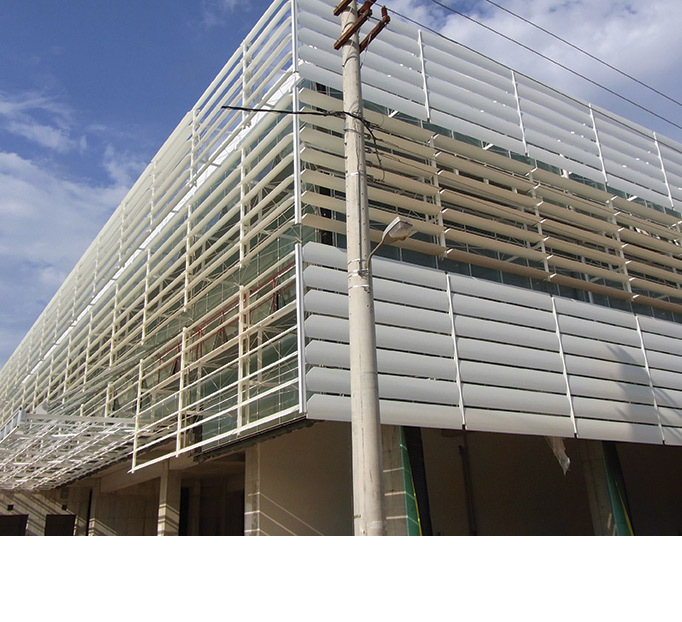 All principal components are manufactured from extruded aluminium alloy type 6063 T6 with stainless steel fixings. 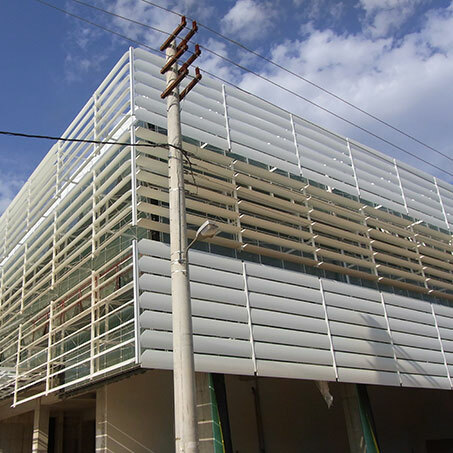 Controllable fins can pivot through 120 degrees and can be controlled by astronomical data operating the actuators to track the path of the sun. 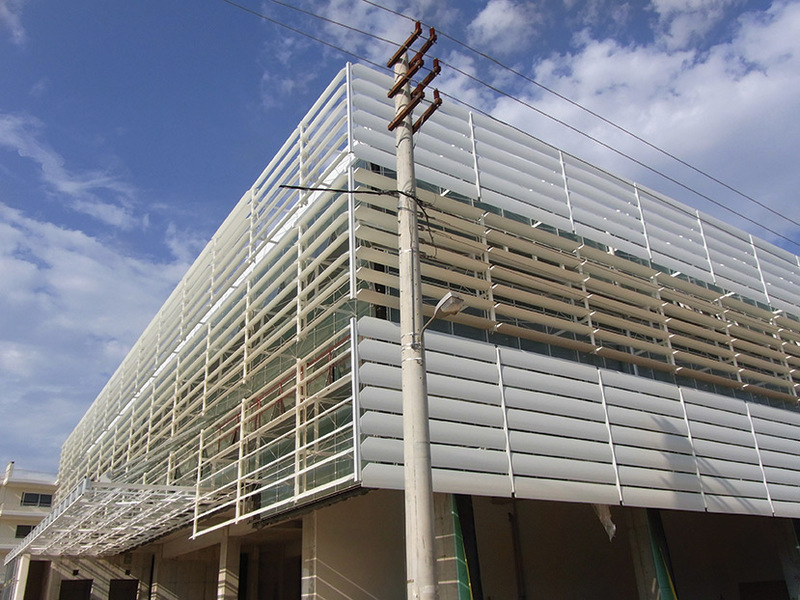 WAREMA CLIMATRONIC is a specially designed computer program that evaluates the effectiveness of a solar shading system. 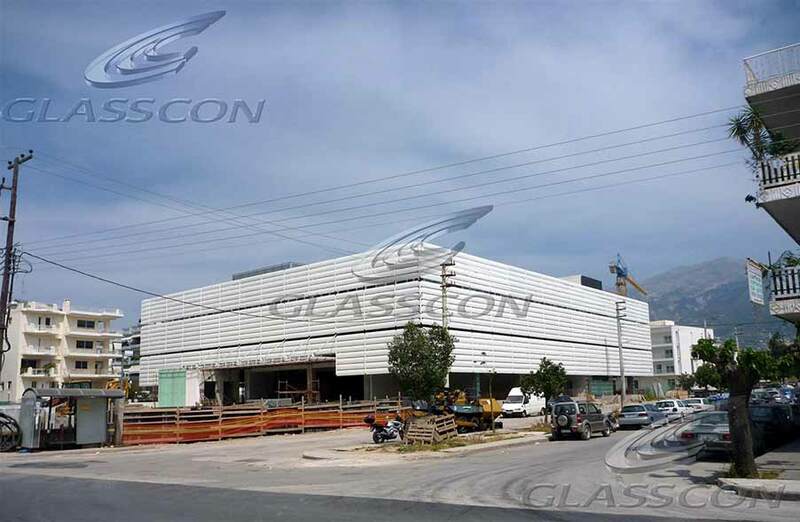 With this program GLASSCON can assess a system design and provide a bespoke solution to meet all aspects of a project. 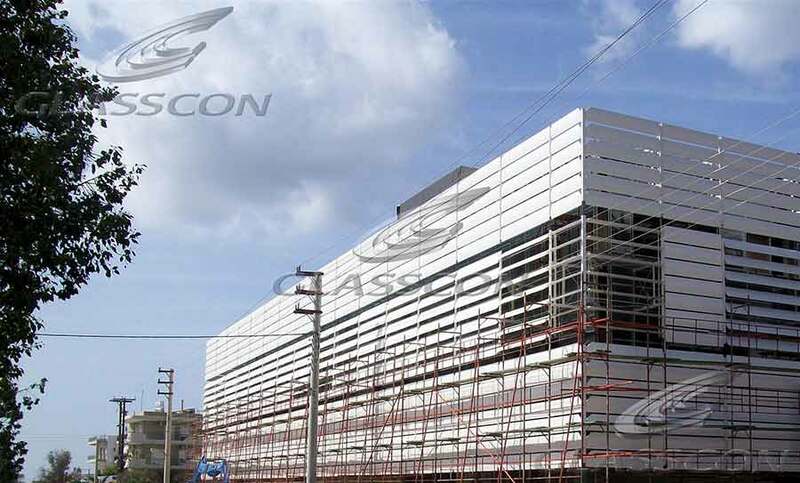 Backed by an experienced technical support team, GLASSCON can work with the customer from the earliest stages of the project to design an aesthetically pleasing, high performance solar shading system. 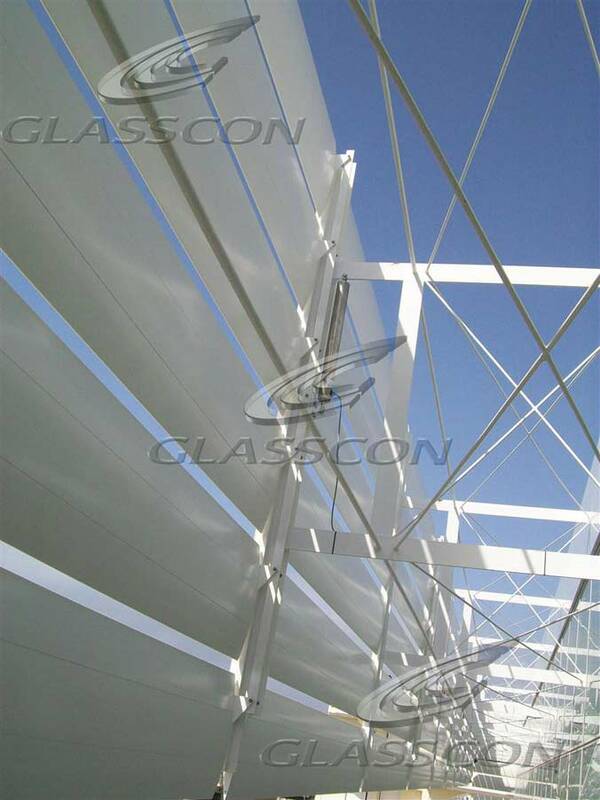 GLASSCON can realise the importance of creativity and individuality when designing a building and offer many bespoke solar systems in such materials as perforated aluminium, wood, terracotta clay, and translucent acrylics.GLASSCON designed, manufactured & installed ca. 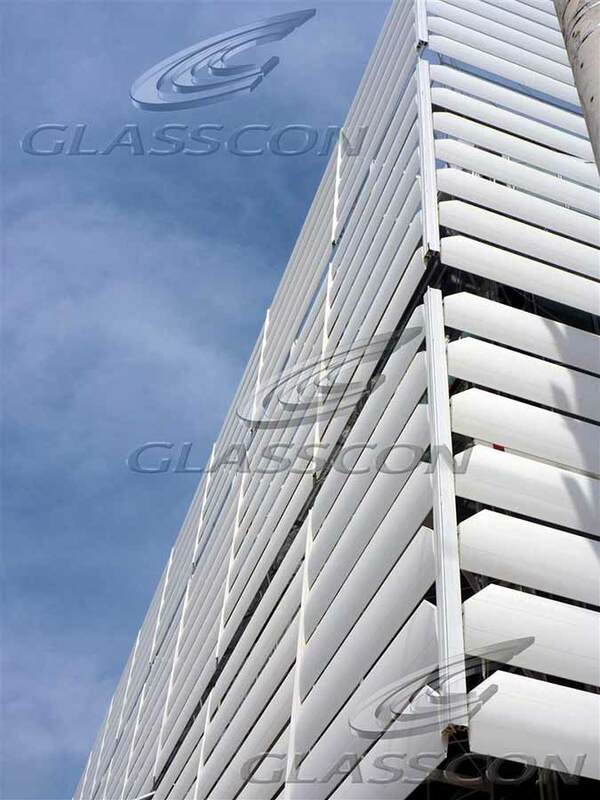 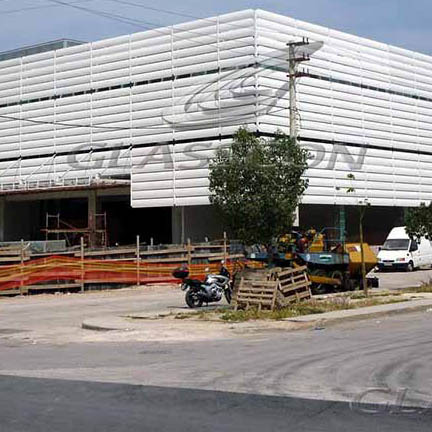 2.900 sqm of motorized aluminum louvers & airfoil solar blinds on the facades of a Telecom office building. 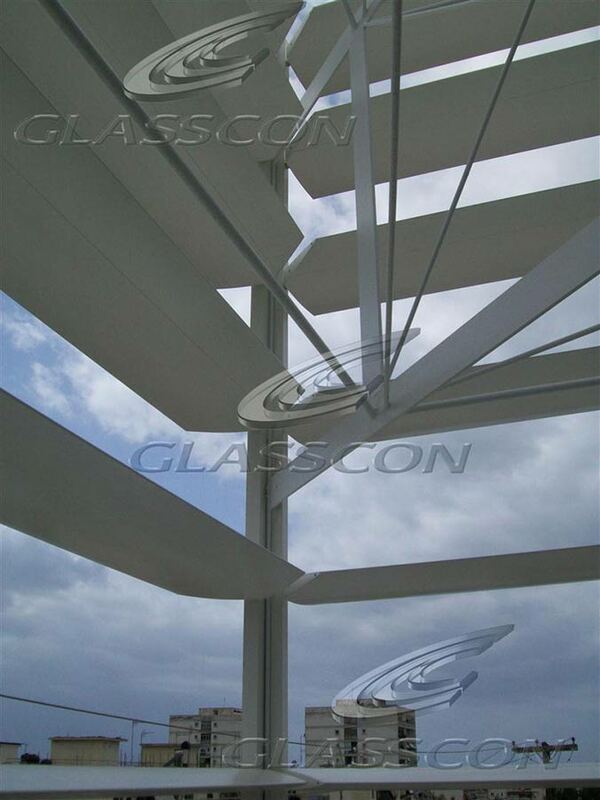 The motion/rotation is achieved by stainless steel IP 65 - ELERO motors & control system from WAREMA Climatronic.